https://matcha-jp.com/en/6266 15 Famous Ramen Shops To Try In Shibuya - Recommended By An Expert! 15 Famous Ramen Shops To Try In Shibuya - Recommended By An Expert! In this article, we will be introducing 15 famous ramen shops in Shibuya recommended by a ramen enthusiast who has eaten over 5000 bowls of ramen. Shibuya is a bustling destination in Tokyo where you can find an abundance of a wide variety of ramen shops. Shibuya is one of Tokyo's busiest districts. As a city constantly bustling with people, it is also home to countless ramen shops in Japan. With an overwhelming number of ramen shops to choose from, it might be a difficult task for some. 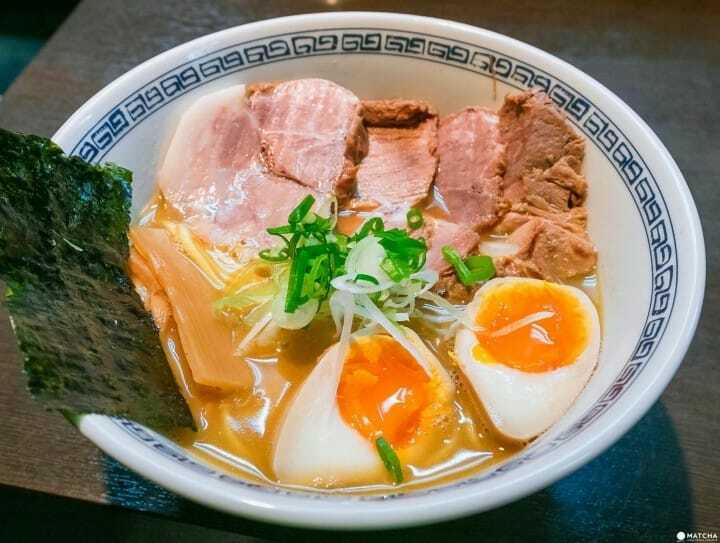 As a solution, this article will be introducing a list of fifteen must-try ramen shops in Shibuya specifically recommended by a ramen enthusiast that has a record of consuming over 5000 bowls of ramen in total and approximately 900 bowls annually. Kiraku is a well-known veteran ramen shop in Shibuya. They serve shoyu (soy sauce) and shio (salt) ramen. I highly recommend the shoyu wantan(*1) noodles (850 yen plus tax). This dish has a nostalgic taste accompanied with the aromatic fragrance of the fried green onions. It is also generously topped with bean sprouts and wantan, making it a fairly hearty meal. If you are looking for a satisfying bowl of ramen in Shibuya, I strongly recommend this restaurant. Apart from ramen, there is also an extensive choice of Chinese cuisine, which is perfect to be enjoyed at night with a glass of beer. Kiraku also practices an effective rotation system which makes the waiting time short, even on busy days. *1: Wantan: Boiled dumplings filled with minced meat. Located a little distance away from Shibuya station is Koku, a famous hidden ramen shop. Out of the three items on the menu, shoyu ramen, shio ramen and tantanmen (dandan noodles), my personal favorite is shio ramen. Pictured above is shio ramen with additional three pieces of wantan (850 plus tax). The shio ramen's uniqueness lies in its mild broth that is unassuming yet outstanding. Despite its simplicity, it is made with a lot of attention to detail. Furthermore, toppings such as chashu (pork belly) and wantan are equally flavorful. An additional order of wantan topping is definitely worth the money. Koku has an unnoticeable shop front and is situated at a confusing location to please pay extra attention when you are looking for it. The shop also has short operating hours and is often out of ramen by the second half of the day. 3. Sugoi Niboshi Ramen Nagi - Anchovy Ramen You Cannot Find Anywhere Else! Sugoi Niboshi Ramen Nagi is an acclaimed ramen shop that specializes in anchovy(*2) ramen, a dish that is scarcely available in Shibuya. Customers can pick between a mild or thick broth. For starters, we highly recommend the rich anchovy ramen (830 yen plus tax) pictured above. The anchovy broth is brewed with 20 different types of anchovies, hence its rich flavor. It is an impactful bowl of ramen that cannot be found anywhere else. The thick noodles it is served with are also homemade. This makes for a harmonious combination together with the exclusive broth. You can also upsize your ramen for free. In addition, the pungent fishy smell that is commonly found in anchovy dishes is skillfully controlled, so even people that don't like fish because of the smell can enjoy this dish! It is also possible to personalize your preferences such as the firmness of the noodles, the density of the flavor and the quantity of oil used. *2: Anchovy: Small fish that has been boiled and dried. Menya Musashi Bukotsu Gaiden is a ramen shop reputable for its generous servings of tsukemen (dipping ramen) noodles. The shop offers three different dipping broths to choose from: black, white and red. The most famous dish is the black rich gaiden tsukemen (1,200 yen plus tax) seen in the picture above. This dish is topped with a shoyu flavored gravy that is of slightly thicker texture. It goes well with the noodles and can also be eaten without the dipping broth as abura soba (ramen without broth). At the same price, a supersize order of up to one kilogram of noodles can also be made. This is be the perfect choice if you are extremely hungry! However, it is also important to make sure not to order more than you can consume. The broth and gravy served at Menya Musashi Bukotsu Gaiden are both on the sweeter side, which might not be everyone's taste. For that reason, you can find a selection of the shop's original blend of condiments at every table. There are also condiments such as vinegar and spice, giving customers the option to adjust the flavor of their ramen according to their personal preferences. In my opinion, Ramen Hayashi is one of the best ramen shops in Shibuya. They offer a sincere menu of only one type of ramen and toppings such as seasoned soft boiled eggs and chashu(1,100 yen plus tax). They do not offer side dishes or alcohol on the menu as a way to keep the focus on their ramen. The broth is cooked with a combination of pork, chicken, and seafood, making it a light broth that is easy to eat. Its quality is reflected in the line you will see outside the shop at any given time of the day. I strongly recommend everyone to give Ramen Hayashi a try and discover a brand new ramen experience of your own. At Ramen Hayashi, there is also a secret shio ramen menu. To order shio ramen, just inform the staff as you hand them your order ticket. If you happen to be in Shibuya and crave a bowl of ramen but don't know where to go, Usagi is the place for you! They offer an extensive menu with items such as ramen, tsukemen (dipping noodles) and tantanmen. For starters, we recommend trying hishio ramen. Pictured above is the hishio ramen with additional toppings of seasoned soft boiled egg and chashu (1,200 yen plus tax). This ramen is light but flavorful. Its broth is made from a blend of soy sauce, gyosho(*3) and dashi (stock) made from chicken and seafood. The gentle broth along with slightly thicker noodles make the perfect combination. An additional topping of seared chashu is also highly recommended as it is not only delicious but also goes exceptionally well with the broth. On top of their regular menu, you can also find special ramen dishes offered for a limited time only. Due to a steady flow of tourists visiting the shop, an English menu is also available. The shop's calm atmosphere makes Usagi a comfortable place to enjoy a bowl of delicious ramen. *3: Gyosho: Seasoning sauce made from the fermentet seafood pickled in large amounts of salt. 7. Menya Mekaji - Simple But Addictive! Menya Mekaji is a ramen shop that serves ramen so addictive that it keeps you craving for more. Serving both ramen and tsukemen, the most shop's most popular dish is tsukemen (880 yen plus tax) as seen in the picture above. A combination of seafood and dark soy sauce gives the broth its rich and dense yet gentle flavor suitable for everyone. This simple bowl of tsukemen might look slightly underwhelming. However, it is assembled with a considerable amount of attention to detail. A great way to enjoy this dish is to pair it with a dash of togarashi(*4). There are also free steamed white rice and raw eggs available for customers dining at Menya Mekaji. There are many ways to enjoy eggs and rice after a bowl of ramen. For example, eating them as tamago kakegohan(*5) or by mixing them together with the leftover ramen broth. I enjoy adding a raw egg into the broth halfway through my meal and finishing it with a bowl of rice mixed in broth. *4: Shichimi togarashi: A blend of spices and condiments such as red peppers and Japanese peppers. *5: Tamago kakegohan: Steamed white rice is eaten with raw egg and soy sauce. Men No Bo Toride is the place to satisfy your tonkotsu (pork bone soup) ramen craving in Shibuya. Pictured above is tonkotsu ramen with additional seasoned soft boiled egg and seaweed (880 yen plus tax). The shop is located close to Shinsen station on the Keio Inokashira Line, however, it is also just a short walk from Shibuya station. Upon entering the shop, you are welcomed by the aroma of tonkotsu ramen. The pungent smell of the pork bone is removed, leaving the broth with a mild flavor and just the right amount of creaminess to keep you satisfied. For the noodles, you can choose between thick or thin homemade noodles. I personally recommend the thick noodles. It is the shop's recommendation to finish off your meal with a serving of steamed white rice topped with ground sesame. The shop's rice is produced at a location reputable for it's delicious rice. It is a definite must-try if you are not too full after the ramen. If you are looking for a bowl of rich and dense ramen or tsukemen, Dogenzaka Mammoth is definitely the place to go! I highly recommend ordering their signature dish, rich tsukemen (800 yen plus tax). The specialty of this dish lies in the richness and viscosity of its broth that is made possible by the combination of pork bones, seafood, and vegetables. Due to its low-fat content, it is also pleasant to the stomach. Two different types of noodles are available to choose from. It is recommended that you try their wheat noodles that match well with the broth. As there are not many ramen shops in Shibuya selling ramen with thick broths, Dogenzaka Mammoth is definitely a noteworthy destination. The shop is often seen with a long line even outside peak hours, however, an efficient rotation system is practiced so customers do not have to queue for long. Owned by a Japanese comedian, Oni Soba Fujigaya is a famous ramen shop in Shibuya. More than just an entertainer's side business, its ramen is just as good as it's competitors. The picture above shows oni shio ramen which is 750 yen plus tax. Made from chicken and seafood, the broth is full of the fragrant fried spring onion aroma and heavily praised by ramen enthusiasts! Not only is the broth outstanding, toppings such as their roasted chicken are exquisite as well. From the taste of their food, it is apparent that a lot of thought and research has been invested all the way to the smallest details. On top of ramen, it is recommended to try the fried rice on their side menu. Its huge portion size makes it an ideal dish to share among friends. Well-known for their generous servings of garlic and vegetables, Chibakara is a reputable ramen shop that originated in Chiba prefecture. They offer options such as ramen, tsukemen, and abura soba. The pictured seasoned soft boiled egg ramen with a slice of pork is highly recommended (990 yen plus tax). Its offers an extremely rich tonkotsu broth, a must-try for those that appreciate heavily flavored ramen. The portion size of the noodles is twice as much as other shops, guaranteed to leave you satisfied. Although only topped with one slice of pork, it is individually sliced into a thickness of three to four centimeters, just the right amount to pair with a rich bowl of ramen. Furthermore, additional toppings such as vegetables are available for free. Just keep in mind to not order more than you need. Art Masashiya is a well-known ramen shop located in the peaceful area of Shibuya Dogenzaka. They have three different types of ramen are available. Their special uma kuchi ramen, their signature dish, is shown in the picture above and 880 yen plus tax. The broth used at Art Masashiya is made from a variety of seafood and rich with minerals such as iron and calcium. The broth is made without chemical seasoning. Another highlight of the broth is the slightly spicy flavor that comes with every taste of the soup. Tamago kakegohan found in the side menu is also an outstanding dish that goes well with the ramen. The shop's interior is furnished like a trendy cafe, a masterpiece only possible through the taste and skills of the owner, that once used to work at a famous apparel store. Located in the center of Shibuya, Art Masashiya is one of the few places customers can go to enjoy a bowl of ramen in a calm, peaceful and relaxing environment. Shinbusakiya is the place to go to for miso ramen in Shibuya. Apart from miso ramen, you can also find other dishes such as the highly recommended aburi miso ramen pictured above with an additional seasoned soft boiled egg and chashu (1,020 yen plus tax). The specialty of Shinbusakiya lies in its broth. Made from a combination of stir-frying miso and garlic at high heat, it is the type of broth best consumed piping hot. Dense with flavors and spices, this is a dish that stimulates greater appetite. Due to its slight greasiness, a great way to enjoy this dish is to pair it with a bit of grated ginger. It goes well together with the bowl of springy miso ramen noodles. Placed at every table is a bottle of garam masala that can be added to the ramen to elevate the flavor. To finish your ramen experience at Shinbusakiya, add a bowl of steamed white rice with a bit of garam masala, creating your very own bowl of curry rice. Garam masala is very powerful so be careful not to add too much! Located in the streets of Shibuya is Kugatsudou, a ramen shop highly recommended for people who like a relaxing bowl of ramen. Kugatsudou concept is a ramen cafe where you can find both ramen and desserts on the menu. There are two types of broths available, thick and thin. The pictured ramen has additional seasoned soft boiled egg and is 980 yen plus tax. The thin broth is made from seafood such as dried bonito flakes and anchovies. This broth has a low fat content and is free of chemical seasoning. However, ramen with a thin broth might not be as satisfying to some people. It is recommended that those looking for a hearty meal try the thick broth based ramen instead. As the shop is based on the concept of a ramen cafe, their desserts are also highly recommended. Feel free to visit Kugatsudou for ramen or desserts in their spacious and beautifully designed shop space. Chuka Soba SAKURAZAKA is a popular and long-established ramen shop located amongst its ramen competitors in the streets of Shibuya. They carry three different types of ramen on their menu. However, it is recommended to taste their signature chinese soba (750 yen plus tax). The broth is mild yet flavorful due to the dried bonito which can be tasted upon your first bite. Their chashu is one of my personal favorites as it is tender and melts in your mouth. For those that are feeling extra hungry, I highly recommend ordering an additional serving of chashu. Another must-try item on the menu is the toripaitan(*6) ramen. In Shibuya, there are not many ramen shops that offer toripaitan rame, so if you do ever crave a bowl of it, do visit Chuka Soba Sakurazaka to satisfy your craving! *6 Toripaitan: Milky broth made by boiling chicken for a long time. It has an appearance that is similar to tonkotsu broth. Let's Enjoy The Ramen of Shibuya! Due to its bustling nature, it is not surprising to find a wide variety of ramen shops in Shibuya. It is also not uncommon to find ramen shops open from night to dawn, which is unique to ramen shops in Shibuya. Please feel free to refer to this article when you are searching for a good bowl of ramen in Shibuya. 10 Fantastic Shinjuku Ramen Shops Recommended By A Ramen Enthusiast! 15 Must-Try Ramen Dishes In Sapporo - Recommended By An Expert! 15 Kyoto Ramen Shops Recommend By A Ramen Enthusiast!